Let’s be honest. The modern church is not exhausting itself on devotion and sacrifice. But you’d sure think so by the way some ministers keep telling them to relax, and quit trying so hard, because Daddy is so pleased with them. Even when a congregation is a listless, flabby, biblically illiterate, club of moody consumers—preachers will heap on them yet one more message of pampered entitlement. Kind of like handing a diabetic a case of Snickers bars. It has gotten so bad that Sundays are a celebration of how much God lets you get away with. They seem so easy going. And why wouldn’t they be, after all the soothing guarantees of God’s unconditional approval. But don’t be fooled. All that veneer of serenity explodes when they come into contact with holiness. They must attack it on sight. What was once normal discipleship, is now legalistic. Anything that dampens their festivities is judgmental. What have we done? We have unleashed a counterfeit liberty. These are not the features of a Spirit-led people. These are the clear symptoms of people with sick souls deceived, and careening toward disaster. How can it be that vessels chosen to uplift the righteous and equip the saints instead conspired to create a system that rewards carnality and shames holiness. How dare you punish a heart for wanting purity? The greatest gift God can send a church is a holy child of God. Their heart is revival. They want the fire, glory and power of God to electrify the church. Make them your enemy and you have also made an enemy out of God. Millions are a captive audience on Easter. Will the preachers say what they need to say? Experts say no. They claim the euphoria of having a crowd will dull the edge of truth. They claim that someone who has been a motivational speaker all year won’t suddenly become a spiritual reformer. This morning I need to explain how our nation flipped so suddenly, and began calling evil good, and good evil. This also happened on the day Jesus died. Pilate was doing everything he could to free Jesus…when things took a dark turn. Pilate told the crowd he would give them a choice to release a prisoner. He was certain they would free Jesus. Many in that crowd heard Jesus teach and their souls were lifted to heaven. Some gained freedom from their dark past. Some in that mob had been healed or their children were healed. But it is not enough for them to condemn the innocent; they must also release the criminal. Having called good evil, they must not call evil good. Who was their choice? In Matthew 27:16 Barabbas is called a “notorious prisoner.” In Mark 15:7, echoed in Luke 23:19, he was “in prison with the rebels who had committed murder. Those same evil spirits have fueled the change that has come over our nation. Many of our citizens have now gone against all of their former values. It was not God’s will for the disciples to defeat the mob and save Jesus from the cross. However, now that He won, we have the right and responsibility to do it. So, I ask you why then—why are we letting them destroy everything that made us great? Why do we passively sit back and watch a movement—that claims to be working for justice—create even more injustice? When they tell us they want to silence the church—when they tell us their opinion is the only one allowed—when disagreeing will cost you your rights, your job, and even your life—when they burn buildings, protect killers, and convict innocent people—the church should have no response? Do we sit back and just lose our freedom of religion and speech? How can we remain silent about the great evil in our nation, on the very day we celebrate Christ’s victory over evil? He did not just win, He devastated demonic power. I am not talking about politics…I am talking about evil. I am talking about evil your children will live under. I am talking about evil that will make it impossible to preach the Gospel in our nation. We should ignore this? It is the calling of the church to enforce the power of the Cross, and the Resurrection, on the works of Satan. This is what it’s all about. Today—above all days—we must realize it! I would tell the relatives and guests that becoming a Christian means forsaking all to follow Christ…and by doing so, they would receive power—power unlike anything they had ever experienced before. Since Easter was an explosion—celebrating it should also be an explosion! If only we would repent. Then we could truly celebrate. If only the people of God would surrender on Easter. The power of the resurrection would overtake us. Great shouts of Hosanna, tears of joy would overwhelm us. And an inward fire to rise up to change our nation. Hallelujah! We are all feeling tremendous anxiety with only a few weeks left to the election. This will be the most important election in American history. We were once a country of freedom, and now we’re becoming a country of tyranny. We are witness to our own people burning down and looting our cities. Ferguson, Missouri, Milwaukee, Orlando, Florida, Baltimore. We are all witness to our own people killing our policemen. Islamic terrorists have killed thousands of people all over our country, and Hillary and Obama want to be politically correct and pretend all the killings are not happening. Soros is a billionaire, who made most of his money manipulating currencies and almost bankrupting many countries. He supports hate groups, who are responsible for taking down our cities. And he is a close friend of Hillary Clinton, and a major supporter of her campaign. Robert De Niro is a millionaire, as are so many of our Hollywood stars who are voting for Hillary, and who have absolutely no tolerance for anyone with a different opinion, forgetting that that is what our country is founded on: freedom of choice. But they will not be affected by Hillary’s open borders. Only our poor and middle class will suffer. Thousands of refugees will flood our nation, and no one will know the good guys from the bad guys. It will kill our economy, which is at an all-time low now under the years of Obama’s presidency. And Hillary boasts of how proud she will be to continue Obama’s legacy. No one can afford health insurance now. Prices for healthcare have gone through the roof thanks to Obamacare. Our once reasonable healthcare is gone. With Hillary as President, we will lose our Second Amendment right to bear arms. Freedom of religion will be attacked, and Hillary will try to stop all conservative voices on TV and radio. Our highest court will become Socialist, and she will restrict what America was founded on, our freedom to become a small business owner and pursue our own personal dreams. She has blood on her hands from the Benghazi terrorist raid. Four of our American patriots died, and when the parents stood over their loved ones’ coffins, she lied to them about the cause of their sons’ deaths. The pendulum of freedom is not balanced. Hillary and her followers are on a crude campaign to stop and degrade all of Trump’s followers. Her words were echoed loud and clear for all Americans to hear. Hillary said Trump’s followers are a basket of deplorables. They are un-redeemable. May God protect the real truth, and may Donald Trump win this presidency. He will save our America, and he will certainly make it great again. Abortion clinics across the United States are closing at the quickest rate since 1973. Is this the result of tougher regulations or a shifting industry dynamic? Since 2011, 162 abortion clinics nationwide have closed or have ceased terminating pregnancies, according to a Bloomberg analysis. Roughly one-third of these clinics were operated by Planned Parenthood, the nation’s largest abortion provider, which performed more than 300,000 abortions last year. Bloomberg attributes this trend to tougher state regulations on abortion. As highlighted in the report, more abortion clinics have closed in Texas than in any other state, due largely to newly enacted laws. Bloomberg reports that at least 30 have closed since the state enactedregulations requiring abortion clinics to adhere to the same health and safety standards as a hospital. Texas also requires abortionists to have hospital admitting privileges to a nearby emergency room, which means that if something goes wrong, they can get their patient to an ER quickly. Pro-abortionists are quick to decry these regulations as an organized attempt to limit a woman’s desire for an abortion, claiming that these requirements burden women. However, several women have died or nearly died from botched abortions in clinics that didn’t have competent clinicians, adequate facilities, or sanitary conditions. If these clinics closed because of these regulations, that would mean they had previously been cutting women open without adhering to the same sanitary standards and building codes as a hospital. However, new regulations aren’t the only reason abortion clinics are closing their doors. As Bloomberg pointed out, about a dozen abortion clinics have closed in California, which is known to be a very liberal state and more abortion friendly than most. In fact, the Golden State has no major types of abortion restrictions, according to the Guttmacher Institute. This means, unlike in many other states, there are no waiting periods, no ER admitting requirements, and no mandated parental involvement for minors seeking abortions. 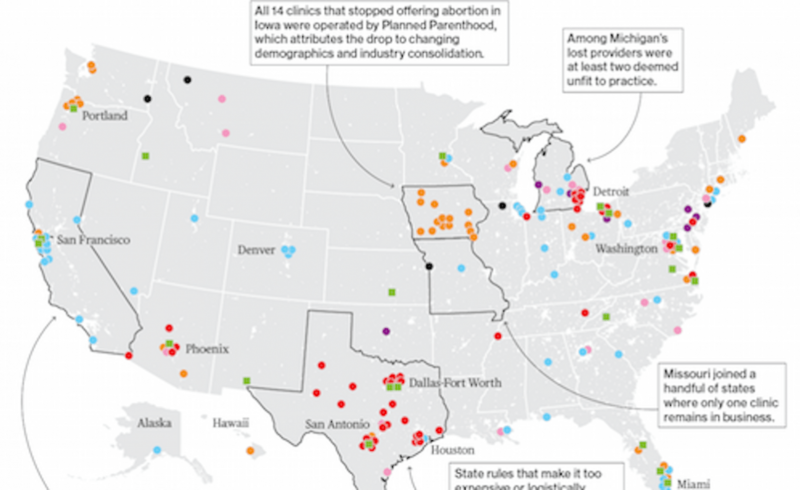 So why are abortion clinics shutting down in a blue, coastal state like California? It seems like the business model of the abortion industry is changing. Many of the clinics that have closed in the past five years no longer make enough money to cover expenses. In fact, almost 40 of the clinics that have closed since 2011 cited business or financial reasons for closing. Decreased demand is part of the reason why. Between 2010 to 2014, the abortion rate has dropped by 12 percent. A closer look at the numbers Bloomberg provided appear to show that abortion clinics are consolidating. About 19 percent of the clinics that closed were located in areas with fewer than 100,000 people. Looking at Bloomberg’s map, it appears that all of the 21 clinics that have opened in recent years are located in urban areas. Planned Parenthood owns three-fourths of these. In short, abortion clinics are moving out of the country and into the city, and most of these are operated by Planned Parenthood.